A highly potent, luxurious duo. Celebrities Secret To Youthful Skin. Featured in Allure, Vogue, NBC & More. Recommended By Plastic Surgeons Before Resorting To Surgery. Anti Wrinkle 55 Gold Serum, described as a magic potion, is a powerful anti-wrinkle Hexapeptide with a Botulinum Toxin-inspired activity. Our Anti Wrinkle Serum is an alternative to topical injections, this molecular cosmetic achieves the same, the relax of the muscles responsible for the formation of expression lines. This hexapeptide formula mimics the N-terminal end of SNAP-25 and competes with this natural protein for a position in the SNARE complex. As a result, neurotransmitters are note released efficiently and facial contractions are weakened and muscles relaxed, thus inhibiting the formation of wrinkles. A Powerful concentrate of anti aging ingredients that delivers Argirline along with other fine ingredients that penetrate the skin to give it a Botox effect. This formula also has soothing Aloe and cucumber extract. Cucumber Extract is a skin care ingredient that helps nourish, hydrate, smooth, soothe skin irritations and reduces swelling as it consists of high quantities of vitamin C and amino acids. Cucumber Extract is rich in vitamins, polyphenols, polysaccharides, minerals and other nutrients. Cucumber extract has skin care benefits for all skin types. This hexapeptide formula has Clinically-proven ingredients that reduce wrinkles and are safer than toxic injections! Rich in antioxidants to protect and repair damage, and because of its immediate and long-term benefits for skin rejuvenation and wrinkle control, this has become the most sought after anti aging product in the industry. Anti Wrinkle 55 Gold is the absolute strongest and best anti wrinkle serum, to help prevent and reduce fine lines and wrinkles. This is the favored wrinkle serum. 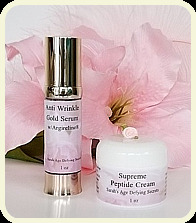 Unlike many faddish cosmetics which freeze the skin and give only short temporary improvement, Anti Wrinkle 55 Gold Serum helps your skin become firm, more supple, and velvety soft, now and for a lasting effect. This wrinkle serum has been called better than Botox in a Bottle because it relaxes facial muscles like injections yet it also provides super-hydration that toxic injections do not. Results are long lasting and with repeated use can keep premature aging at bay. This Extraordinary Wrinkle Serum is formulated with Sodium Hyaluronate. Sodium hyaluronate has become popular with the cosmetic industry and anti-aging skin care products for its ability to penetrate skin and hold onto water. Sodium hyaluronate is the salt form of skin-replenishing ingredient hyaluronic acid and is considered more effective for skin. Sodium hyaluronate has a smaller molecular size as HA (making it especially penetrative), and is able to hold more water than any other natural substance - up to 1,000 times its weight in water! Thanks to these to attributes, when applied topically to the skin it can reach deep down into the dermis layers. It then It binds water and nutrients deep down while attracting water to plump the skin. Sodium hyaluronate helps your skin retain moisture while reducing trans-epidermal water loss. Read The Article Sodium Hyaluronate - The Secret To Youth! Dr Oz Says Peptides Are A Fabulous Botox Alternative. He said, "Like Botox Peptides take A Triple-Action Approach. They penetrate the skin and build new collagen and work to fill in wrinkles for a long term effect. Peptides dramatically improve the appearance of skin's resilience, tone and texture, while decreasing the appearance of fine lines and wrinkles. The Neropeptide ArgirelineNP®: acetyl hexapeptide-3 and Palmitoyl Pentapeptide-3 is of particular interest for their collagen boosting abilities to fill in wrinkles, tighten facial skin, relax facial muscles so they don't move as much, and reduce wrinkles. Argireline is the latest and most effective ingredient to imitate the effects of Botox. It combats the appearance of wrinkles by re-energizing and hydrating the skin, while increasing firmness. It is safe for damaged, mature or fragile skin." If you are looking for an anti-aging product that produces AMAZING results quickly, look no further! "Anti Wrinkle 55 Gold Serum" helps reduce the depth of the wrinkles in the face caused by the contraction of the muscles of facial expression, especially in the front and around the eyes. Anti-Wrinkle 55 serum uses proven Argirilene peptides and hyaluronic acid to put collagen production in overdrive and help you to stay young and feel young. This super moisture and collagen enhancing serums 24K gold flakes disappear into the skin, pulling toxins out and gently opening pores to accept the serum. It removes old skin build up and infuses every cell with omega 3's that skin must have to be healthy. The softest of all metals, 24k gold made from real gold is a natural product, so that you can ensure a pure quality of gold that will not cause an allergy to your sensitive skin. When applied to the skin, it separates into ultra-fine, invisible particles and is absorbed easily. Gold influences the skin at a cellular level giving new energy, clarity and anti-aging control. The skin feels fresh, glowing and revived. Instantly, you will see how the this Serum will nourish, hydrate, and rejuvenate your skin by creating the youthful glow women and men desire throughout their aging process. This amazing serum will help you look younger within days!! It will eliminate the need for expensive and painful injections. Anti Wrinkle 55 Gold is like a liquid face lift... penetrating cells, cleansing detoxifying, protecting, rejuvenating, rapidly delivering Argireline... your wrinkles will virtually disappear! Your skin will receive vital nutrients at the same time Hyaluronic Acid firms and moisturizes your skin… like it has never been moisturized before! All this means your wrinkles will get smaller and smaller everyday, while your skin becomes softer, smoother, more radiant and younger looking. In only days, you’ll look years younger... prettier... even envied by friends! This serum is so Powerful there is no need to bill you electronically every month like many of the others. It will automatically be the first thing on your anti aging beauty agenda. You will have the option to re-order on your own...your skin and better instincts will let you know. Quit throwing your money away on products that don't work or work only for the moment. This serum is long term, which means the longer you use it, the younger and more beautiful your skin will become. So get off the bandwagon and into the Fountain of Youth. Hope to see you there. 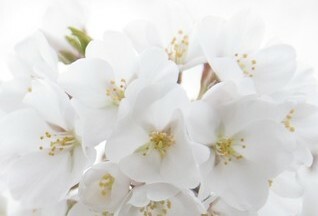 want to restore the beauty of their youth. They will LOVE you for it. product for an immediate refund (less shipping & handling); even if the bottle is empty. A Luxury Cream Made With Pearl Powder, Argireline®, and An Explosion Of Vitamins, Minerals, & Antioxidants. A Voluptuously textured super hydrating cream. This is a great product, and after using for just a short time noticed a real difference on my face. I live in a dry climate and it drys up my skin easily. I like this product a lot. It keeps me hydrated and moisturized. I highly recommend. I have used this product for at least two years, and it keeps me looking much younger than I am. It absorbs quickly and really does lighten wrinkles. Thanks for creating a great product. - Wow that says it all!! When I read about this product claiming to do all sorts of miraculous things for your complexion I was hopeful but skeptical. Lets just say that it did all it claimed and more. The supple and youthful glow I have is unbelievable. OMG my plan is to never run out of this product. The wrinkles around my eyes are gone. I'm 42 and I'm looking in my mid 30's. Send me a case. Thanks so much. - Wow what an amazing product! I have been using your product for a month and I have seen some amazing changes around the eye area. Thank you for a great product that really works! **The text contained in this web site is for informational purposes and is not meant to be a substitute for the advice provided by your own physician, dermatologist or medical professional. The information contained herein is not intended for diagnosing or treating a health problem or disease. Information and statements regarding cosmetic grade products are not evaluated by the Food and Drug Administration and are not intended to diagnose, treat, cure, or prevent any disease. Customers' reviews/testimonials may be provided for information purposes related to the effectiveness of Sarah's Age Defying Secrets products, however, results vary from person to person.